Nanette’s mom is a senior who relies upon Medicare as her only source of income and health coverage. Our seniors have given so much to make this country great and it’s our responsibility to make sure America keeps the promise that was made to them. Whether it’s through Medicare or Social Security, hardworking seniors who’ve paid in their entire lives deserve the security of knowing these programs will be there when they need them. As a diabetic, Nanette’s mom has had to choose between medication and groceries. No senior in America should have to make such a terrible choice. Republicans, including House Speaker Paul Ryan and presidential candidate Jeb Bush, have suggested we cut benefits, gamble them on Wall Street and even dismantle these programs altogether. Instead, we need to strengthen and expand them, reduce fraud and waste and ensure everyone pays their fair share so these critical programs will be in place for years to come. Education is the foundation of our nation. It’s a right — not just a privilege afforded to America’s wealthy. We must be dedicated to strengthening early education in order to provide our nation’s youth with the schooling they deserve. We need to make college more affordable for everyone. Rising tuition rates and excessive student loan rates make college nearly impossible to pay for these days. Congress must recognize that community colleges, trade schools, and universities can transform lives. A college degree opens up doors that would otherwise remain closed. Higher education lifts up communities and helps end the cycle of poverty. Students should never have to turn down a college degree because of their financial status. Every child in America should have a pathway to success through an outstanding educational experience. That is one reason Nanette dedicated pro bono hours as a child rights advocate to ensure children’s special educational needs were met. Education is the one of Nanette’s top priorities because she firmly believes it is the number one equalizer. Nanette is a product of public schools. Her story of beating the odds and success today is something she credits because of her opportunity to get an education. Making sure early childhood education is funded and available to communities of all backgrounds, especially low-income communities of color that have the biggest disadvantage in our educational system. Making college more affordable. Nanette herself came out of college then law school with a lot of debt that impacted her ability to choose what type of jobs she could afford or not afford to take. Every child deserves the opportunity to attain a college degree and in the future, we should provide free-to-low-cost education to students who want an education. For those prefer trade schools and skills, we need to make sure they have access and affordable training. Addressing the school-to-prison pipeline created by the disparity in school discipline that disproportionately impacts children of color. We need to be more creative in disciplining students rather than pulling them out of class so they are not learning. This is not only an educational issue but a civil rights issue. Nanette is the daughter of immigrant parents. Her parents both came to this country so that they could provide for their children what they were never afforded. Immigrants are a crucial part of our nation’s economy, particularly in Southern California, and we need to embrace them and help better incorporate them into our society. Republican “solutions” to immigration is to deport immigrants, to build a fence on the border and to refuse citizenship, inhibit any sort of dialogue on the issue and prevent us from taking steps forward. We need to focus on solutions like the comprehensive Immigration Reform bill that already passed the U.S. Senate with bipartisan support. In addition, we must provide a path to citizenship for immigrants who are working day in and day out to contribute to our nation’s economy. The children of immigrants also require our attention and action. By supporting the DREAM Act, we are giving the sons and daughters of immigrants who were born outside of the U.S. but grew up here, a chance to take part in the American dream. Nanette understands that climate change is an urgent environmental problem and she intends to act accordingly. She will fight to combat climate change and work to transition us to clean, renewable energy. Besides closing tax loopholes and ending subsidies for toxic polluters, Nanette knows we have to employ creative strategies to attract and incentivize clean green businesses to locate in the 44th District. 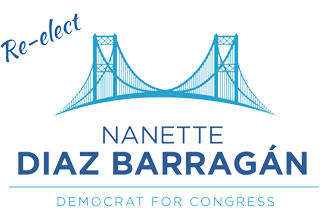 As a councilmember, Nanette championed environmental initiatives and will continue to support and lead efforts to preserve open space, cut greenhouse gas emissions, and increase solar installations by making them more affordable. She supports local efforts to determine the feasibility of Community Choice power to supply cleaner, locally-produced, lower cost energy to our communities. Most recently, she was a leader in the successful fight that prevented oil drilling in the Santa Monica Bay. Nanette worked with grassroots community activists to soundly defeat Measure O at the ballot box despite a multimillion dollar campaign by oil companies. In recognition of her work, Nanette was honored by the Sierra Club with one of their 2015 political leadership awards on the environment. Nanette will continue to fight to protect our public health. There is no issue more important than the health of our families. That’s why we need a representative who will not pander to big corporate polluters who put the health and safety of our communities at risk– raising asthma rates and respiratory illness and making climate change impacts worse. We owe it to our children to leave them a better planet than the one we inherited. We can and will move towards a sustainable future for our community by ending tax breaks for these polluters and using that money to create new, good-paying, renewable energy jobs and taking the positive steps to protect our community’s health currently harmed by pollution. By investing in these clean technologies, we can not only create jobs here in our community, but also make significant progress in our journey to preserve a healthy, prosperous future for the generations to come and put America back in control of our own energy destiny. As an advisor to large and small businesses for the last ten years, Nanette understands the need to balance business interests and jobs for our communities. We need to find ways to incentive clean green businesses to our district that will bring long-term jobs that do not put workers’ health and our communities at risk. A stronger middle class means a stronger economy. We need to create robust job training programs, support small businesses and invest in growing technologies like clean energy to ensure our economy is growing and thriving. We also need a fair economy. No one who works full-time – often at more than one job – should struggle to put food on the table. Right now the federal minimum wage is $7.25 per hour. A full-time minimum wage employee earns $15,080 annually. In 2012, the poverty threshold for a single person was $11,945 or $22,283 for a family of four. We need to fix that with a higher minimum wage. We’ll also make America’s families stronger by demanding that hardworking women get paid the same as men when they do the same job. In Congress, Nanette will be a champion for our veterans to ensure they are treated with dignity and she advocate for them to receive high quality service and comprehensive benefits to address their daily challenges. America’s role on the global stage has become increasingly important over the years. We continue to maintain our presence as a world leader thanks to the efforts of our men and women in uniform. Unfortunately, we have lost too many of these courageous fighters to unnecessary wars. Congress needs to pledge to uphold America’s presence internationally, while striving for diplomacy and peace by restricting the use of military force in order to save American lives and taxpayer dollars. A robust foreign policy plan can benefit Americans domestically, by ensuring American lives are secure. We also need to provide support for our democratic allies in key regions, such as Israel. Although the year is 2015, many of our nation’s policies reflect outdated times. One of America’s greatest injustices is the pay inequity between men and women in our country: For every $1 a man makes, a woman makes just 77 cents. For women of color, it’s even less. In today’s world, with so many parents struggling to make ends meet, and so many moms working long hours at multiple jobs and still struggling to put food on the table, this is simply unacceptable. Congress needs to pay attention to this continuing problem – it is unfair and it hurts families. But Congress – at more than 80% men – shouldn’t be trying to force their views on the rest of us and judge what’s right for every woman in America. We should be investing in programs that help women get the health and reproductive care they need – not slashing funds for these critical programs. We must defend a woman’s right to choose. And we must make sure that women aren’t forced to choose between having a family and having a job – with increased protections in the workplace and paid leave for parents. Nanette currently represent children in their schools who have special needs to make sure their educational needs are met. As a member of Congress, she will continue to advocate for children and adults with special needs and disabilities. Homelessness is a critical issue that Nanette intends to address in Congress. Nanette believes the first step in addressing this issue in making sure Congress funds sufficient mental health services and programs, invests in affordable housing and that we are taking care of our veterans.